12450 4' x 6' 75 lbs. 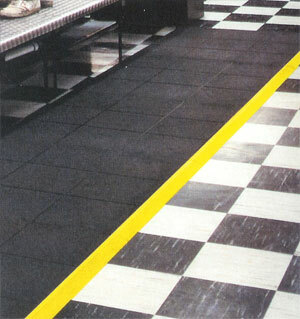 Protect your expensive flooring with Tritan Floor Saver matting, 4' x 6' rubber mat. 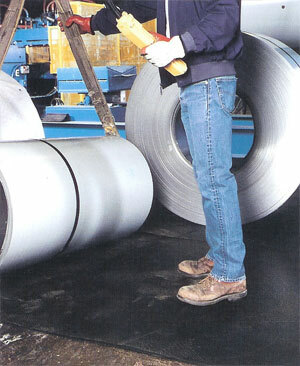 Ideal for steel warehousing and weightrooms, protects both floor and stored materials. Slip-resistant diamond design surface for worker safety. Made from the same tough combination of rubber and fiber as other Tritan products for strength and durability. 57150 36" x 36" Mat 22 lbs. 57162 3' bevel strip male 2 lbs. 57164 3' bevel strip female 2 lbs. 56673 40" bevel strip mail w/corner 2 lbs. 56674 40" bevel strip female w/corner 2 lbs. Colors: Black mats, Black and Safety Yellow bevels. Solid surface features grid pattern for surer footing. Provides easy movement of wheeled equipment. Made in 36" x 36" modules with built-in connector strip on two sides for easy expansion of floor coverage. Ideal for industrial applications and weight rooms.